Utility knife blades, hook blades, linoleum blades, box cutter blades. These blades can be used with knives found on our Utility knives page. Additional hand tools are listed on the Hand tools page. 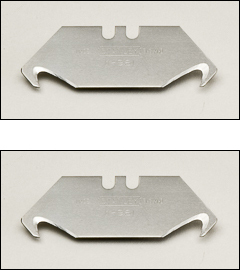 WARNING: Proposition 65 Label for all utility knife blades shown below, except the E2252 and E2230. These standard thickness sharp blades all have the same 2 notches on the top edge of blade. The E2206 and E2207 are the same blade that is sold in either a dispenser or a bulk pack. The E2252 blade has a center hole for use in a utility knife with a side trigger. There are no center holes in the other two blades. E2206: order by the hundred. 100 blades in a plastic dispenser. Lower prices for 600 or 2,400 blade orders. E2207: order by the pack. 400 blades per pack. Each pack contains 4 stacks of 100 blades wrapped in paper. E2252: order by the hundred. 100 blades in 20 packs of 5. This blade has a center hole for side triggers. Extra heavy-duty thicker blade with 2 notches on top of blade. Cut sheet material without damaging the surface below the cut. Quantity shown after bulk and best prices indicates number of packs to order for those lower prices. Tempered high carbon steel for clean cuts. This blade fits the E2106 knife (Stanley #10209) listed on our Utility knives page. Blades are packed 10/box, but can be ordered in any lesser quantity.